“We have so much to discuss u need to be careful but we can help our country,” Warner texted the lobbyist, Adam Waldman, on March 22, 2017. “I’m in,” Waldman, whose firm has ties to Hillary Clinton, texted back to Warner. The story also includes this paragraph, which also has gotten less attention. Warner began texting with Waldman in February 2017 about the possibility of helping to broker a deal with the Justice Department to get the WikiLeaks founder Julian Assange to the United States to potentially face criminal charges. That went nowhere, though a Warner aide told Fox News that the senator shared his previously undisclosed private conversations about WikiLeaks with the FBI. Interestingly, the Fox story relies on texts that Warner and Richard Burr jointly requested in June (targeting Waldman’s phone, not Warner’s, apparently), and then turned over to the committee in October. I look forward to seeing how the notoriously anti-leak Burr deals with the apparent leak of committee sensitive materials to the right wing press. Even while the story links to texts from SSCI, it comes a week after a woman duped the famously paranoid Julian Assange into exchanging texts with her fake Sean Hannity account promising news on Mark Warner. [Dell] Gilliam, a technical writer from Texas, was bored with the flu when she created @SeanHannity__ early Saturday morning. The Fox News host’s real account was temporarily deleted after cryptically tweeting the phrase “Form Submission 1649 | #Hannity” on Friday night. Twitter said the account had been “briefly compromised,” according to a statement provided to The Daily Beast, and was back up on Sunday morning. Just minutes after @SeanHannity disappeared, several accounts quickly sprung up posing as the real Hannity, shouting from Twitter exile. None were as successful as Gilliam’s @SeanHannity__ account, which has since amassed over 24,000 followers. Gilliam then used her newfound prominence to direct message Assange as Hannity within hours. 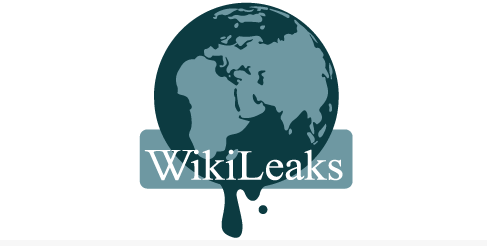 “I’m happy as long as there is a fight!” Assange responded. Gilliam reassured Assange that she, or Hannity, was also “definitely up for a fight” and set up a call for 9:30 a.m. Eastern, about six hours later. “You can send me messages on other channels,” said Assange, the second reference to “other channels” he made since their conversation began. With that in mind, I want to look at the timing of some security issues last year. While the texts turned over to Congress date to February 14, the conversation pertaining to Steele started around March 22. That puts it not long after news of a massive hack involving T-Mobile, first reported March 16. An unusual amount of highly suspicious cellphone activity in the Washington, D.C., region is fueling concerns that a rogue entity is surveying the communications of numerous individuals, likely including U.S. government officials and foreign diplomats, according to documents viewed by the Washington Free Beacon and conversations with security insiders. A large spike in suspicious activity on a major U.S. cellular carrier has raised red flags in the Department of Homeland Security and prompted concerns that cellphones in the region are being tracked. Such activity could allow pernicious actors to clone devices and other mobile equipment used by civilians and government insiders, according to information obtained by the Free Beacon. It remains unclear who is behind the attacks, but the sophistication and amount of time indicates it could be a foreign nation, sources said. I would hope to hell that former cell company mogul and current Ranking Member on the Senate Intelligence Committee running an important counterintelligence investigation Mark Warner would be aware of the security problems with mobile phones. But what do I know? [Update: Not much. Looking more closely it looks like he was using Signal.] In the last several months we’ve learned that FBI’s investigators discuss the even more sensitive aspects of the more important side of counterintelligence investigation on SMS texts on their Samsung cell phones. But who knows what Waldman (who apparently chats a lot with spies, mobbed up Russian oligarchs, and — as Mike Pompeo deemed Wikileaks — non-state hostile intelligence services) knows about cell phone security? We are also concerned that the government has not adequately considered the counterintelligence threat posed by SS7-enabled surveillance. What resources has DHS allocated to identifying and addressing SS7-related threats? Are these resources sufficient to protect U.S. government officials and the private sector. If the government started considering such issues in March, they might have gotten around to discovering what kinds of problems were created by the T-Mobile hack in June, when Warner and Burr moved to get the texts for SSCI. In any case, at around that point in time, APT 28 (one of the entities blamed for hacking the DNC the previous year) started a phishing campaign targeting the Senate’s email server. Beginning in June 2017, phishing sites were set up mimicking the ADFS (Active Directory Federation Services) of the U.S. Senate. By looking at the digital fingerprints of these phishing sites and comparing them with a large data set that spans almost five years, we can uniquely relate them to a couple of Pawn Storm incidents in 2016 and 2017. The real ADFS server of the U.S. Senate is not reachable on the open internet, however phishing of users’ credentials on an ADFS server that is behind a firewall still makes sense. In case an actor already has a foothold in an organization after compromising one user account, credential phishing could help him get closer to high profile users of interest. Reporting at the time suggested this was an effort in advance of the 2018 election (which aside from minimizing the damage Russia might do in the interim, ignores the fact that staffers are ostensibly prohibited from using Senate resources for election related activities). But it always seemed to me it would more profitably target policy. Or, maybe the only reasonable work Congress is doing to investigate the Russians? Whether there’s a connection between these two compromises last year or not, and Julian Assange, and this Mark Warner story, it’s clear that DC remains ill-prepared to address the counterintelligence problems they’re faced with. Worse, Evanina said two ridiculous things in the hearing that raises real questions about the policy and his ability to implement it fairly. First, Thomas Massie asked Evanina whether political views would be considered. Massie, after having noted the committee notes suggested a social media search might have identified Snowden as a potential threat (Snowden did spend time online before his classified career, but nothing would have obviously flagged him), also noted their similar political contribution histories. “Do you take into account political support when you’re doing background research on social media?” After Evanina explained the background check would not review that, Massie asked specifically about whether a person supported a candidate who was strong on the Fourth Amendment.”Your belief in Fourth Amendment would not have any predication on whether you could hold or maintain a security clearance,” Evanina replied in response. Breaking! You can believe in the Fourth Amendment and get a security clearance. Only, that’s not true if you’re a convert to the Fourth Amendment (as Snowden arguably was, given his online comments). Barely mentioned at the hearing were the guidelines the Intelligence Authorization had laid out for this policy, which I wrote about here and here. One thing Congress explicitly wanted to measure was “change in ideology” (I believe this was always included in security clearance determinations, but it has a much different impact if one is reviewing everyone’s candid thoughts), the kind of thing when someone who once railed against leakers in public comments goes on to question whether surveillance has gotten out of hand, as Snowden did. Or as a lot of other people did, when they considered the impact of their dragnets. The other ridiculous thing Evanina said came in response to Ted Lieu’s concerns about the number of Asian Americans charged with spying charges that later collapsed (something that Judy Chu has also been hitting on). Lieu also mentioned that since the public reports of spying cases collapsing, he has heard from some people who believe they were denied security clearances because of their (presumably Chinese-American) ethnicity. So Lieu asked Evanina if that’s ever a consideration. Evanina not only claimed that it is not a consideration (in spite of the case of the man who was denied clearance because of the USAID-tied organization his wife worked for), but he offered up that in his 19 years at FBI, they had also never used ethnicity as a reason for investigation. There’s one ginormous problem with that claim (which was sworn). 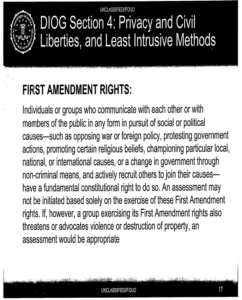 Evanina was at FBI when, in 2008, they changed the Domestic Investigations and Operations Guide (as noted above) to permit consideration of First Amendment protected activities, including religion, among the things FBI Agents may take into account during an investigation. FBI employees may take appropriate cognizance of the role religion may play in the membership or motivation of a criminal or terrorism enterprise. If, for example, affiliation with a certain religious institution or a specific religious sect is a known requirement for inclusion in a violent organization that is the subject of an investigation, then whether a person of interest is a member of that institution or sect is a rational and permissible consideration. Similarly, if investigative experience and reliable intelligence reveal that members of a terrorist or criminal organization are known to commonly possess or exhibit a combination of religion-based characteristics or practices (e.g., group leaders state that acts of terrorism are based in religious doctrine), it is rational and lawful to consider such a combination in gathering intelligence about the group-even if any one of these, by itself, would constitute an impermissible consideration. Worse, Evanina served in a policy role when, in 2011, they reinforced this permission in that year’s DIOG. Admittedly, religion is not the same thing as ethnicity. But for a number of ethnicities, including Chinese and Muslim Arabs, religion can stand in for a kind of ethnicity. It may be that Evanina was foolish enough to raise his FBI experience, which might be entirely unrelated to the practice of security clearance evaluations. But he did. And that raised some really good reasons (on top of the known record and explicit direction from Congress about what this social media approach should entail) to doubt his assurances to the committee about civil liberties problems with this policy. I get that it makes sense to review someone’s social media to see if they can keep a secret. But it is also the case that the IC generally, the FBI in particular, and Evanina personally, are not credible on this point. On Sunday, 60 Minutes brought attention to an issue first exposed by researchers some years back: the ease with which people can use the SS7 system that facilitates global mobile phone interoperability to spy on you. Sharyn Alfonsi: If you just have somebody’s phone number, what could you do? Karsten Nohl: Track their whereabouts, know where they go for work, which other people they meet when– You can spy on whom they call and what they say over the phone. And you can read their texts. 60 Minutes was smart in that they got Congressman Ted Lieu to agree to be targeted. Congressman Lieu didn’t have to do anything to get attacked. All Karsten Nohl’s team in Berlin needed to get into the congressman’s phone was the number. Remember SS7 –that little-known global phone network we told you about earlier? Karsten Nohl: I’ve been tracking the congressman. [snip]Sharyn Alfonsi: Are you able to track his movements even if he moves the location services and turns that off? Karsten Nohl: Yes. The mobile network independent from the little GPS chip in your phone, knows where you are. So any choices that a congressman could’ve made, choosing a phone, choosing a pin number, installing or not installing certain apps, have no influence over what we are showing because this is targeting the mobile network. That of course, is not controlled by any one customer. Sharyn Alfonsi: What is your reaction to knowing that they were listening to all of your calls? Rep. Ted Lieu: I have two. First, it’s really creepy. And second, it makes me angry. Sharyn Alfonsi: Makes you angry, why? Rep. Ted Lieu: They could hear any call of pretty much anyone who has a smartphone. It could be stock trades you want someone to execute. It could be calls with a bank. Karsten Nohl’s team automatically logged the number of every phone that called Congressman Lieu — which means there’s a lot more damage that could be done than just intercepting that one phone call. So now Lieu is furious — and pushing House Oversight Committee to conduct an investigation into SS7’s vulnerabilities. Of course, it’s probably best to think of SS7’s vulnerabilities not as a “flaw,” as 60 Minutes describes it, but a feature. The countries that collectively aren’t demanding change are also using this vulnerability to spy on their subjects and adversaries. But the fact that Lieu — who really is one of the smartest Members of Congress on surveillance issues — is only now copping onto the vulnerabilities with SS7 suggests how stunted our debate over dragnet surveillance was and is. For two years, we debated how to shut down the Section 215 dragnet, which collected a set of phone records that was significantly redundant with what we collected “overseas” — though in fact the telecoms’ production of such records was mixed together until 2009, suggesting for years Section 215 probably served primarily as legal cover, not the actual authorization for the collection method used. We had very credulous journalists talking about what a big gap in cell phone records NSA faced, in part because FISC frowned on letting NSA collect location data domestically. Yet all the while (as some smarter commenters here have said), NSA was surely exploiting SS7 to collect all the cell phone records it needed, including the location data. Members of Congress like Lieu — on neither the House Intelligence (which presumably has been briefed) or the House Judiciary Committees — would probably not get briefed on the degree to which our intelligence community thrives on using SS7’s vulnerabilities. What I find perhaps most interesting about this new flurry of attention on SS7 is that the researchers behind it were hired by some “international telecoms” to find ways to improve security sometime in advance of December 2014 (when they first presented their work). 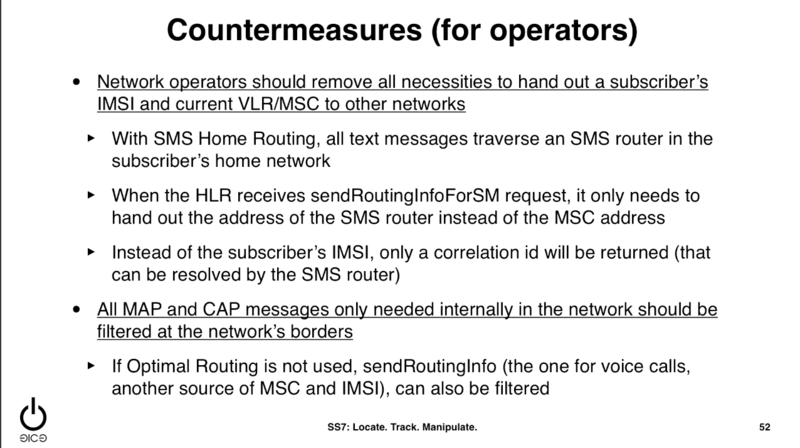 The original CCC presentation on this vulnerability (see after 40:00) included a general discussion of what cell phone providers could do to increase the security of their users (see above). 60 Minutes noted that some US providers were doing more than others. 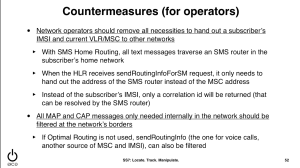 The NSA presumably could and did use entirely SS7 collection for cell phones — especially US based ones — until such time as domestic providers started making them less accessible (and once they were unaccessible overseas, then subject to legal process, though even some of the countermeasures would still leave a US user exposed to other US providers). That needs to be understood (should have been, before the passage of USA Freedom) to really understand the degree to which Congress has any influence over the NSA. A number of outlets are reporting that Ted Lieu and Blake Farenthold have written a letter to NSA Director Mike Rogers urging him not to implement the new data sharing effort reported by Charlie Savage back in February. While I’m happy they wrote the letter, they use a dubious strategy in it: they suggest their authority to intervene comes from Congress having “granted” NSA authority to conduct warrantless collection of data. 2 See Foreign Intelligence Surveillance Act and the Patriot Act. As an initial matter, they’ve sent this letter to a guy who’s not in the chain of approval for the change. Defense Secretary Ash Carter and Attorney General Loretta Lynch will have to sign off on the procedures developed by Director of National Intelligence James Clapper; they might consult with Rogers (if he isn’t the one driving the change), but he’s out of the loop in terms of implementing the decision. Perhaps the most striking of those is that, even while the White House claimed “there were very, very few changes to Part 2 of the order” — the part that provides protections for US persons and imposes prohibitions on activities like assassinations — the EO actually replaced what had been a prohibition on the dissemination of SIGINT pertaining to US persons with permission to disseminate it with Attorney General approval. In addition, agencies within the Intelligence Community may disseminate information, other than information derived from signals intelligence, to each appropriate agency within the Intelligence Community for purposes of allowing the recipient agency to determine whether the information is relevant to its responsibilities and can be retained by it. The 2008 version requires AG and DNI approval for such dissemination, but it affirmatively permits it. In addition, elements of the Intelligence Community may disseminate information to each appropriate element within the Intelligence Community for purposes of allowing the recipient element to determine whether the information is relevant to its responsibilities and can be retained by it, except that information derived from signals intelligence may only be disseminated or made available to Intelligence Community elements in accordance with procedures established by the Director in coordination with the Secretary of Defense and approved by the Attorney General. Given that the DNI and AG certified the minimization procedures used with FAA, their approval for any dissemination under that program would be built in here; they have already approved it! The same is true of the SPCMA — the EO 12333 US person metadata analysis that had been approved by both Attorney General Mukasey and Defense Secretary Robert Gates earlier that year. Also included in FISA-specific dissemination, the FBI had either just been granted, or would be in the following months, permission — in minimization procedures approved by both the DNI and AG — to conduct back door searches on incidentally collected US person data. In other words, at precisely the time when at least 3 different programs expanded the DNI and AG approved SIGINT collection and analysis of US person data, EO 12333 newly permitted the dissemination of that information. What Bush did just as he finished moving most of Stellar Wind over to FISA authorities, was to make it permissible to share EO 12333 data with other intelligence agencies under the same kind of DNI/AG/DOD approval process already in place for surveillance. They’ve already been using this change (though as I note, in some ways the new version of EO 12333 made FAA sharing even more permissive than EO 12333 sharing). And Savage’s article describes that they’ve intended to roll out this further expansion since Obama’s first term. Obama administration has been quietly developing a framework for how to carry it out since taking office in 2009. Intelligence officials began working in 2009 on how the technical system and rules would work, Mr. Litt said, eventually consulting the Defense and Justice Departments. This month, the administration briefed the Privacy and Civil Liberties Oversight Board, an independent five-member watchdog panel, seeking input. Before they go into effect, they must be approved by James R. Clapper, the intelligence director; Loretta E. Lynch, the attorney general; and Ashton B. Carter, the defense secretary. All of which is to say that if Lieu and Farenthold want to stop this, they’re going to have to buckle down and prepare for a fight over separation of powers, because Congress has had limited success (the most notable successes being imposition of FAA 703-705 and Section 309 of last year’s intelligence authorization) in imposing limits on EO 12333 collection. Indeed, Section 309 is the weak protection Dianne Feinstein and Mark Udall were able to get for activities they thought should be covered under FAA. Two more points. First, I suspect such expanded sharing is already going on between NSA and DEA. I’ve heard RUMINT that DEA has actually been getting far more data since shutting down their own dragnets in 2013. The sharing of “international” narcotics trade data has been baked into EO 12333 from the very start. So it would be unsurprising to have DEA replicate its dragnet using SPCMA. There’s no sign, yet, that DEA has been included under FAA certifications (and there’s not, as far as we know, an FAA narcotics certificate). But EO 12333 sharing with DEA would be easier to implement on the sly than FAA sharing. And once you’ve shared with DEA, you might as well share with everyone else. Finally, this imminent change is why I was so insistent that SPCMA should have been in the Brennan Center’s report on privacy implications of EO 12333 collection. What the government was doing, explicitly, in 2007 when they rolled that out was making the US person participants in internationally collected data visible. We’ve seen inklings of how NSA coaches analysts to target foreigners to get at that US person content. The implications of basing targeting off of SPCMA enabled analysis under PRISM (which we know they do because DOJ turned over the SPCMA document, but not the backup, to FISC during the Yahoo challenge), currently, are that US person data can get selected because US persons are involved and then handed over to FBI with no limits on its access. Doing so under EO 12333 will only expand the amount of data available — and because of the structure of the Internet, a great deal of it is available. Probably, the best way to combat this change is to vastly expand the language of FAA 703-705 to over US person data collected incidentally overseas during next year’s FAA reauthorization. But it will take language like that, because simply pointing to FISA will not change the Executive’s ability to change EO 12333 — even secretly! — at will. After acknowledging that as more than 20 million people have been affected by the hack of the Office of Personnel Management, OPM head Katherine Archuleta “resigned” today. In announcing that Office of Budget and Management Deputy Director of Management Beth Cobert would serve as acting Director, Josh Earnest played up her experience at McKinsey Consulting. So we may see the same kind of management claptrap as OPM PR in the coming days that we got from CIA’s reorganization when McKinsey took that project on. Over 20 minutes into his press conference, Earnest also revealed there was 90 day review of the security implications of the hack being led by OMB. Happily, in spite of the easy way Archuleta’s firing has served as a proxy for real solutions to the government’s insecurity, at least some in Congress are pushing other “solutions.” Given Congress’ responsibility for failing to fund better IT purchasing, consider agency weaknesses during confirmation, and demand accountability from the intelligence community going back at least to the WikiLeaks leaks, these are worth examining. Perhaps most predictably, Susan Collins called for passage of cybersecurity legislation. It is time for Congress to pass a cybersecurity law that will strengthen our defenses and improve critical communication and cooperation between the private sector and government. We must do more to combat these dangerous threats in both government and the private sector. Of course, nothing in CISA (or any other cybersecurity legislation being debated by Congress) would have done a damn thing to prevent the OPM hack. In other words, Collins’ response is just an example of Congress doing the wrong thing in response to a real need. Giving corporations immunity is not the answer to most problems facing this country. And those who embrace it as a real solution should be held accountable for the next government hack. Freshman Nebraska Senator Ben Sasse — both before and after Archuleta’s resignation — has appropriately laid out the implications of this hack (rebutting a comparison repeated by Earnest in his press conference, that this hack compares at all with the Target hack). OPM’s announcement today gives the impression that these breaches are just like some of the losses by Target or Home Depot that we’ve seen in the news. The analogy is nonsense. This is quite different—this is much scarier than identity theft or ruined credit scores. Government and industry need to understand this and be ready. That’s not going to happen as long as Washington keeps treating this like just another routine PR crisis. But one of his proposed responses is to turn this example of intelligence collection targeting legitimate targets into an act of war. Some in the defense and intelligence communities think the attacks on OPM constitute an act of war. The rules of engagement in cyber warfare are still being written. And with them, we need to send a clear message: these types of intrusions will not be tolerated. We must ensure our attackers suffer the full consequences of their actions. Starting now, government needs to stop the bleeding—every sensitive database in every government agency must be immediately secured or pulled offline. But playing defense is a losing game. Naming and shaming until the news cycle shifts is not enough. Our government must completely reevaluate its cyber doctrine. We have to deter attacks from ever happening in the first place while also building resiliency. We’re collecting the same kind of information as China — in methods that are both more efficient (because we have the luxury of being able to take off the Internet) but less so (because we are not, as far as we know, targeting China’s own records of its spooks). If this is an act of war than we gave reason for war well before China got into OPM’s servers. Meanwhile, veterans Ted Lieu and Steve Russell (who, because they’ve had clearance, probably have been affected) are pushing reforms that will affect the kind of bureaucracy we should have to perform what is a core counterintelligence function. A number of people online have suggested that seeing Archuleta get ousted (whether she was forced or recognized she had lost Obama’s support) will lead other agency heads to take cybersecurity more seriously. I’m skeptical. In part, because some of the other key agencies — starting with DHS — have far to much work to do before the inevitable will happen and they’ll be hacked. But in part because the other agencies involved have long had impunity in the face of gross cyberintelligence inadequacies. No one at DOD or State got held responsible for Chelsea Manning’s leaks (even though they came 2 years after DOD had prohibited removable media on DOD computers), nor did anyone at DOD get held responsible for Edward Snowden’s leaks (which happened 5 years after the ban on removable media). Neither the President nor Congress has done anything but extend deadlines for these agencies to address CI vulnerabilities. Perhaps this 90 day review of the NatSec implications of the hack is doing real work (though I worry it’ll produce McKinsey slop). But this hack should be treated with the kind of seriousness as the 9/11 attack, with the consequent attention on real cybersecurity fixes, not the “do something” effort to give corporations immunity. There’s a funny line in the House Judiciary Committee’s report on USA F-ReDux. Amid the discussion of the new Call Detail Record function, it explains the government will be doing CDR chaining on “metadata it already lawfully possesses,” even as providers will be chaining on metadata in their possession. In addition, the government can use the FISC-approved specific selection term to identify CDRs from metadata it already lawfully possesses. The line should not be surprising. As I reported in 2013, the NSA does what are called “federated” queries, metadata chaining across data collected from a variety of sources. This line, then, simply acknowledges that the government will continue to conduct what amounts to federated queries even under the new system. The data almost certainly comes from at least 3 sources: metadata taken from PRISM collection in databases that get copied wholesale (so Internet metadata within a hop of a foreign target), records of international phone calls, and records from Internet data collected overseas. The latter two, of course, would be collected in bulk. So within the report on a bill many claim ends bulk collection of American’s phone records is tacit admission that the bulk collection continues (not to mention that the government has broad access to data collected under PRISM). After yesterday’s 338 – 88 vote in the House in favor of USA F-ReDux, a number of people asked me to explain my view on the bill. First, the good news. As I noted, while the language on CDR chaining in the actual bill is muddled, the House report includes language that would prohibit most of the egregious provider-based chaining I can imagine. So long as nothing counters that, one of my big concerns dating back to last year has been addressed. I also opposed USAF last fall because I expected the Second Circuit would weigh in in a way that was far more constructive than that bill, and I didn’t want a crappy bill to moot the Second Circuit. While there are many things that might yet negate the Second Circuit ruling (such as conflicting decisions from the DC or 9th Circuits or a reversal by SCOTUS), the Second Circuit’s decision was even more useful than I imagined. But that’s part of why I’m particularly unhappy that Specific Selection Term has not been changed to require the government to more narrowly target its searches. Indeed, I think the bill report’s language on this is particularly flaccid. Section 501(b)(2)(A) of FISA will continue to require the government to make ‘‘a statement of facts showing that there are reasonable grounds to believe that the tangible things sought are relevant to an authorized investigation….’’50 Section 103 requires the government to make an additional showing, beyond relevance, of a specific selection term as the basis for the production of the tangible things sought, thus ensuring that the government cannot collect tangible things based on the assertion that the requested collection‘‘is thus relevant, because the success of [an] investigative tool depends on bulk collection.’’ 51 Congress’ decision to leave in place the ‘‘relevance’’ standard for Section 501 orders should not be construed as Congress’ intent to ratify the FISA Court’s interpretation of that term. These changes restore meaningful limits to the‘‘relevance’’ requirement of Section 501, consistent with the opinion of the U.S. Court of Appeals for the Second Circuit in ACLU v.Clapper. Meaningful limits on “relevant to” would be specific guidelines for the court on what is reasonable and what is not. Instead, USA F-ReDux still subjects the narrowness of an SST to a “greatest extent reasonably practicable” standard, which in the past we’ve seen amount to prioritization of the practicability of spying over privacy interests. While people can respectfully disagree on this front, I believe USA F-ReDux still permits both bulk collection of non-communications records and bulky collection of communications records (including FBI’s Internet collection). In the wake of the Second Circuit opinion, I find that especially inexcusable. We have every reason to believe the CDR function covers all “calls,” whether telephony or Internet, unlike the existing dragnet. Thus, for better and worse, far more people will be exposed to chaining than under the existing dragnet. It will catch more potential terrorists, but also more innocent people. As a result, far more people will be sucked into the NSA’s maw, indefinitely, for exploitation under all its analytical functions. This raises the chances that an innocent person will get targeted as a false positive. The data collected under the new CDR function will be circulated far more broadly than status quo. Existing dragnet orders limit access to the results of queries to those with special training unless one of four named individuals certifies that the query result relates to counterterrorism. But USA F-ReDux (and the current minimization procedures for Section 702 data; USA F-ReDux will likely use the PRISM infrastructure and processing) makes it clear that FBI will get access to raw query results. That almost certainly means the data will be dumped in with FBI’s PRISM and FISA data and subjected to back door searches at even the assessment level, even for investigations that have nothing to do with terrorism. As on the NSA side, this increases the risk that someone will have their lives turned upside down for what amounts to being a false positive. It also increases the number of people who, because of something in their metadata that has nothing to do with a crime, can be coerced into becoming an informant. And, of course, they’ll still never get notice that that’s where this all came from, so they will have a difficult time suing for recourse. One other significant concern I’ve got about the existing bill — which I also had last year — is that the emergency provision serves as a loophole for Section 215 collection; if the FISC deems emergency collections illegal, the government still gets to keep — and parallel construct — the data. I find this especially concerning given how much Internet data FBI collects using this authority. I have — as I had last year — mixed feelings about the “improvements” in it. I believe the amicus, like initial efforts to establish PCLOB, will create an initially ineffective function that might, after about 9 years, someday become effective. I believe the government will dodge the most important FISC opinion reporting, as they currently do on FOIAs. And, in spite of a real effort from those who negotiated the transparency provisions, I believe that the resulting reporting will result in so thoroughly an affirmatively misleading picture of surveillance it may well be counterproductive, especially in light of the widespread agreement the back doors searches of Section 702 data must be closed (while there are a few improvements on reporting to Congress in this year’s bill, the public reporting is even further gutted than it was last year). And now there’s new gunk added in. One change no one has really examined is a change extending “foreign power” status from those proliferating WMDs to those “conspiring” or “abetting” efforts to do so. I already have reasons to believe the WMD spying under (for example) PRISM is among the more constitutionally problematic. And this extends that in a way no one really understands. Even more troublesome is the extension of Material Support maximum sentences from 15 to 20 years. 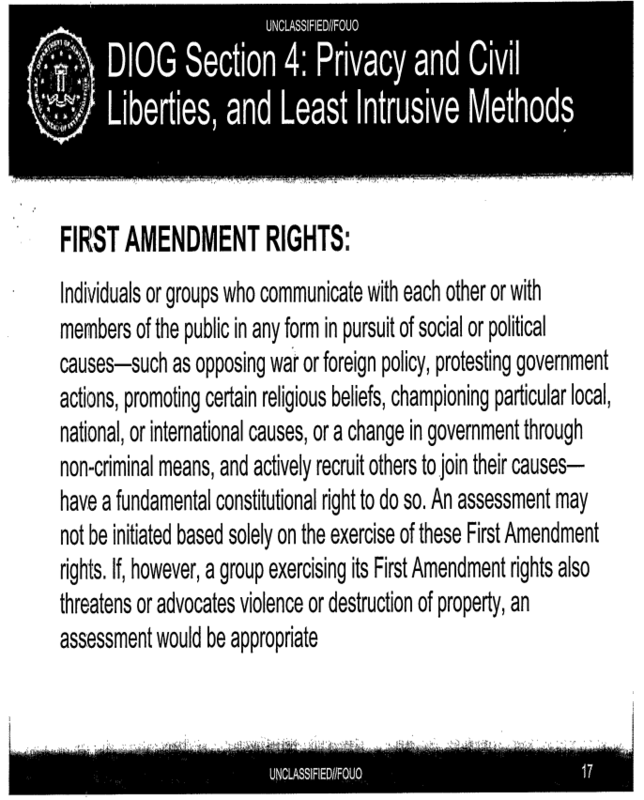 Remember, under Holder v. HLP, a person can be convicted of material support for First Amendment protected activities. Thus, USA F-ReDux effectively embraces a 20 year sentence for what could be (though isn’t always) thought crimes. And no one has explained why it is necessary! I suspect this is an effort to use harsh sentences to coerce people to turn informant. If so, then this is an effort to recruit fodder for infiltrators into ISIS. But if all that’s correct, it parallels similar efforts under the Drug War to use excessive sentences to recruit informants, who — it turns out in practice — often lead to false convictions and more corruption. In other words, at a moment when there is bipartisan support for sentencing reform for non-violent crimes (for which many cases of Material Support qualify), USA F-ReDux goes in the opposite direction for terrorism, all at a time when the government claims it should be putting more emphasis on countering extremism, including diversion. So while I see some advantages to the new regime under USA F-ReDux (ironically, one of the most important is that what surveillance the government does will be less ineffective! ), I am not willing to support a bill that has so many bad things in it, even setting aside the unconstitutional surveillance it doesn’t address and refuses to count in transparency provisions. I think there need to be privacy advocates who live to fight another day (and with both ACLU and EFF withdrawing their affirmative support for the bill, we at least have litigators who can sue if and when we find the government violating the law under this new scheme — I can already identify an area of the bill that is certainly illegal). That said, it passed with big numbers yesterday. If it passes, it passes, and a bunch of authoritarians will strut their purported support for liberty. At this point, however, the priority needs to be on preventing the bill from getting worse (especially since a lot of bill boosters seem not to have considered at what point they would withdraw their support because the bill had gotten too corrupted). Similarly, while I’m glad bill sponsors Jim Sensenbrenner and Jerry Nadler say they won’t support any short-term extension, that may tie their own hands if what comes back is far worse than status quo. There’s some good news there, too. The no votes on yesterday’s House vote were almost exclusively from supporters of privacy who believe the bill doesn’t go far enough, from Justin Amash to Jared Polis to Tom Massie to Donna Edwards to Ted Poe to rising star Ted Lieu and — most interestingly — Jan Schakowsky (who voted for the crappier House bill when she was on HPSCI last year). Hopefully, if and when Mitch McConnell throws in more turdballs, those who opposed the bill yesterday can whip efforts to defeat it.